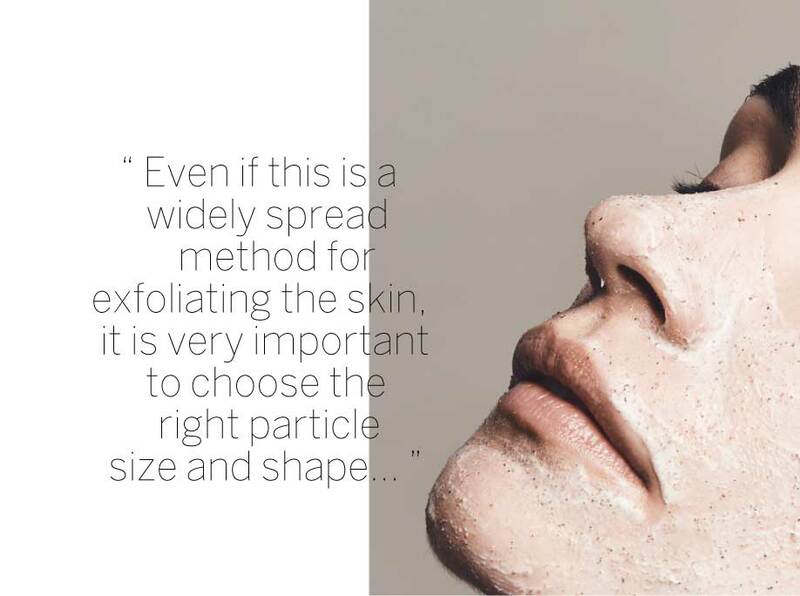 When thinking about exfoliating your skin, there are many variables to consider, but the must important is to make sure you understand the different types of exfoliation methods available in the market. There are three types of exfoliation: mechanical, enzymatic and chemical. The first one is the most commonly used at home, in which you physically rub off the dead skin cells with a scrub product based on particles or a brush. The friction generated by the particles or the tools is what creates what we call a “sanding effect” that eventually will loosen the upper skin layer of dead cells. Even if this is a widely spread method for exfoliating the skin, it is very important to choose the right particle size and shape as depending on the roughness and irregularity of the grains, this method could result in serious irritation. Exfoliating mechanically, you should avoid harsh methods like big shells or crushed seeds grains, so you don’t cause micro-tears in your skin. You could use very thing, round-shaped grains like bamboo micro particles, or entire seeds that have soft edges and are effective but not dammaging to the skin. Enymatic exfoliation is when we use enzymes to digest the union between the proteins in the skin, and help the upper layers detach easier from the surface. This is why they are also called “proteolitic enzymes”, because they decompose the proteins into smaller pieces. The enzymes used in skincare are also the same fruit enzymes we use for improving food digestion, they are commonly obtained from the papaya and the pineapple fruits. 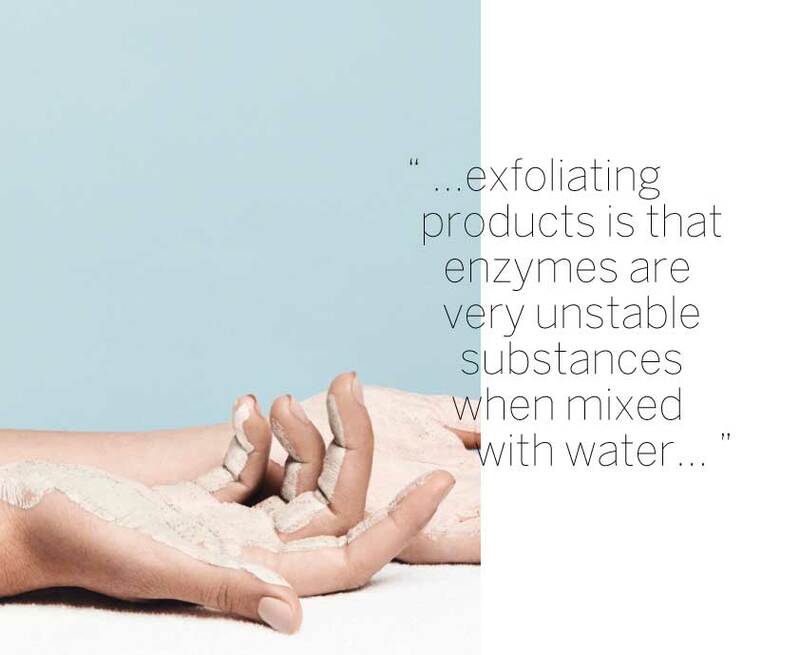 The important fact about this kind of exfoliating products is that enzymes are very unstable substances when mixed with water, therefore if you purchase and enzymatic peel, it should be powder based, and you should be able to mixed it with water right before its use to ensure the maximum efficacy to the skin. Chemical exfoliation pursues the skin’s cellular renewal with the help of acids. To get the most out of the acids they need to be used at a low PH, only under the control of a professional. The acid peelings you find for home use are not so efficient as they are formulated in a safe PH level. This divides on 3 different kinds. Is a type of acid that attacks the water content in the skin. When the skin feels the water is been taken away, many “emergency” mechanisms start activating, thus these peelings create a cellular turnover activation, stimulating the formation of new skin, and at the same time, drying out the upper layers so much, that they detach easily. Some alpha-hydroxy acids are: glycolic acid, malic acid, tartaric acid, mandelic acid, citric acid, lactic acid. The clinical studies report that these acids help increase the epidermal thickness, the amounts of glycosaminoglycans and collagen and elastin density in the dermis. The cons of alpha-hydroxyacids is the fact that it prolonged use can sensitize the skin and make it more vulnerable to the UV radiation. Also known as Salicylic, is very similar to the alpha-hydroxy acids with the main difference being that it attacks the oil in the skin, instead of the water. In other words: it is lipid-soluble. The way this acid enters into the skin is through the sebaceous folicles, making it suitable to treat oily skin types, comedons, acne and other problems related to excess of skin oil. The other good aspect of this kind of chemical peel, is its anti-inflammatory activity. A third less known kind of acids are the poly- hydroxy acids, being them the gluconolactone and the lactobionic acid. They are structurally identical to alpha-hydroxy acids with the main difference in the bigger molecular size. This bigger size makes them more secure as the acid cannot penetrate deep into the skin, but also less effective, as it can only reach certain layers of the epidermis. The good part of these acids is that they are apart from secure, very moisturizing to the skin. If you choose to exfoliate chemically, you can choose how gentle or aggressive is the product you’re using, so you should pick the right acids depending on your type of skin and whether you are using it for your face or your body.